The Rotation Model's "Dirty Little Secrets"
An article for Rotation.org by Neil MacQueen. This article will make more sense if you know what the Workshop Rotation Model is. We're now up to ten "Dirty Little Secrets! " The Workshop Rotation Model was originally created in response to a set of problems that most Sunday Schools experience. Thus, even if you don't use the Rotation Model, you have undoubtedly experienced many of the same problems described below and in this article, and may find some of our insights and solutions helpful. While some look at Rotation as a creative way to do Sunday School (and it is), when we came up with the Rotation model, creativity was already part of our Sunday School DNA. Instead, we were looking for PRACTICAL SOLUTIONS to GIVEN PROBLEMS. For example, we knew our volunteers were, ...volunteers! And maybe not always the best trained or prepared. The Rotation Model CONFESSES THAT as a given. I have often called these confessions annd workarounds, "Rotation's Dirty Little Secrets," because they confess something about our folks that we don't often say out loud. More importantly, we needed a Model that didn't let these problems hold back our program. So...yes, yes, yes, "Rotating to different workshops is creative and great for the kids,"
that well the first time. The Rotation Model solves this problem by having the teachers repeat their lesson for several weeks in a row, to different groups. In Rotation, we're simply recognizing that the first week is a dry-run, and the 2nd week, repeating the lesson to a new group will be a lot better. Remember how important teacher training used to be? In effect, the Rotation Model creates in-class, on-the-job training. Doesn't matter who you are or how much experience you have, repetition is as important to our teachers as it is to our students. The Rotation Model admits this, and embraces it. To the average volunteer, repetition is a godsend, especially to those with poor preparation skills. To good teachers, repetition allows them to hone their approach, and really get creative. Application: Even in a small church, ideally you want to have a minimum of two groups rotating. This let's you take advantage of the "do better next week" effect. Also makes life easier on the teacher. To leaders and lesson writers, repeating lessons means your hard work and great ideas are no longer captive to bad preparation. It means your teachers can tweak your great ideas to make them more workable, and add their own insights/tweaks as well. In the old model, they were always back at square one each week. Most of our volunteer teachers want to succeed. The Rotation Model gives them that chance. And teachers who feel fulfilled are usually happy to say "yes" the next time around. In spite of best intentions and training, the average volunteer will never prepare as much as we want them to. If you don't agree with this statement, you probably haven't been involved with Sunday School very long! And in spite of our best preparation, every teacher knows how to better prepare "the next time" -- if we give them a chance to do the lesson again. When the traditional model changes the lesson every week, it leaves us in a perpetual state of "less-prepared-than-we-want." Rather than badger volunteers, or set them up to feel guilty and inadequate, Rotation allows them a DO-OVER. If they blow the lesson the first week for whatever reason, they have all next week to re-think and prepare to do-over with the next class. Quite frankly, knowing what we know about our volunteers (and ourselves), it's amazing that anyone thought the traditional new-lesson-per-week model was the right approach for most of our volunteers. Great idea if you're selling curriculum, though. Dirty Secret #3: We Rotate to "cover" for some of our teachers. We rotate our kids to different teachers because some of our wonderful volunteers are simply not that good. Yes, I wish this were UNtrue, but I'm a realist. EVERY church has volunteers who for whatever reason, just aren't good some of the time, or most of the time, but they want to help. You know who I'm talking about. The problem with the old model is that we sentenced entire grades to those mediocre teachers for an entire year. Do 4th graders who spend an entire year with Mr. Boring and Miss Perpetually Unprepared return to become excited 5th graders? Not so much. The Rotation Model reduces the inevitable exposure of our kids to sub-par volunteers. And by assigning those volunteers to easy and exciting workshops, or a workshop more suited to their skills and limitations, we MINIMIZE what they lack, and MAXIMIZE what they're good at. The corollary to this is that some workshops are easier to teach than others, and those are good workshops to slot-in certain teachers. I've met teacher's like this who acted like they owned the room, were resistant to change, and were unaccountable to the leadership. Interestingly, some of them actually WERE good teachers in some ways, but they tended to be stuck in their ways, and were impervious to direction. The kids get exposed to a wider variety of caring adults, each with their own talents. And I've met quite a few "old Sunday School warhorses" who actually prefer Rotation once they try it. Oh...and catch this: many of "those old-school teachers" LIKE having the opportunity to focus in a workshop better suited to their style. "Mr Smith who never met an art project he liked," never has to teach in the Art Workshop. But you know, he was great when it came to games, and he now does all our Bible Games workshops. Dirty Secret #5: We Rotate because Creative Lesson Prep is NOT that Easy. Few volunteers have the time and resources to pull off a new creative lesson every week when you are changing the story on them every week. Under the old model, Sunday morning could resemble a mad scramble for props, game pieces, art supplies, videos, markers, script copies, Bible pictures, and every other thing you WISH you had more time to assemble. And the more creative you are, the bigger the burden. Not only is repeating the lesson helpful, but having WORKSHOPS is extremely helpful as well. The Art Workshops is always full of art supplies, the Video Workshop already has the equipment and popcorn ready. The Drama Workshop is already set-up with staging, props and costumes. And once you set it up for the Last Supper Drama or art project or video, it can STAY THAT WAY for your four or five week rotation. In the traditional model, you have to reset the room every week to accommodate a new lesson. From the kids' perspective, they get super-creative and memorable lessons EACH week in really fun rooms. In Rotation you can actually JUSTIFY bringing a real row-boat into your Drama Workshop for Peter and Jesus Walk on Water, or making it out of refrigerator box. In the traditional model, you'd make it out of cushions or chairs. In Rotation, you can have really comfy furniture to watch your videos in. In the traditional model, your multi-purpose room has you sitting in folding chairs every week. Rotation allows us the freedom to imagine, create, and take a breather. Part of the problem was that the traditional printed curriculum was like a safety blanket to some. Another part of the problem is that the published curriculum assumed the teacher might not have all sorts of supplies and equipment. But at least in our church the biggest truth was that most of our volunteers simply didn't take the time to look at the extra resources we had. The Rotation Solution: Instead of trying to "supplement" our traditional boring curriculum with videos, in Rotation we create an audio-visual workshop where the lesson CENTERS on that medium and the room always has the equipment ready to be used. There is no other lesson activity or unrelated materials in that room. It's all about the video. We create an Art Workshop that is taught with real art materials by teachers who like art, and filled the room with all our art supplies, rather than hiding them in cabinets around the building. We created a music workshop and staffed it with teachers who LIKED to teach with music, (such a concept). If the teacher doesn't like using video or real art, or computers, or skits, they simply aren't recruited to teach that kind of workshop. Dirty Secret #7: We Rotate Into "Workshops" to regain the Learning Space and Give Us Time and a Great Excuse to Assemble Creative Decor! In the traditional model, most Sunday School classrooms are sterile and multi-purpose. Each classroom looks pretty much like the next. And though every year we encouraged teachers to decorate, most rarely did more than hang a few posters and add a new coat of construction paper on the bulletin board. We expected the teachers to decorate, to make their rooms invited, and too often the results were underwhelming. By making the classrooms "their room for the year" the creative leaders were left merely with the power of suggestion. Rotation puts creative people in control of EACH classroom's design, i.e., the "workshop." The teachers come into a creative space already set up for their lessons. They only have to make sure the supplies for their lesson are out and ready. And because Rotation slows down the rate of story change, ...focusing on a single story for four or five weeks in a row, the workshop design and teacher can dress up the workshop space to match the STORY. The kids get learning environments they can't wait to get into, and the teacher gets a workshop where all the creative materials are at hand, not out-of-sight in a closet. Dirty Secret #8: We Rotate so that we can experiment with creative ideas. 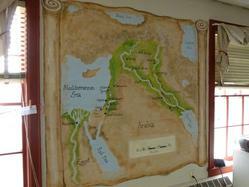 A Paul's Journey rotation can now have a "Philippi Prison" room, or a "Map" workshop. A music workshop can be converted to a computer lab for part of the year. Your Pentecost lessons can have a sailboat and movement workshop. The traditional model clogged our classrooms with tables and chairs. It required leaders to ask teachers for permission to change the space and schedule. Rotation Model brings flexibility to your space and planning. 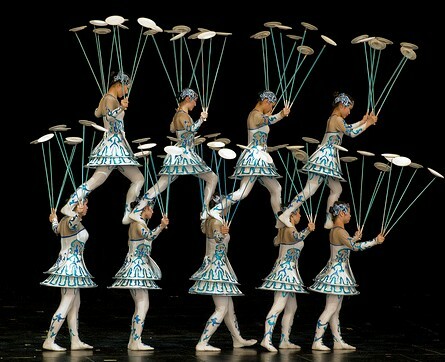 It puts leaders and creativity back at the center of the program, rather than on the periphery. Dirty Secret #9: We Rotate because not all our kids are there every Sunday. In many churches, attendance is off to the point where the average kid is only there every other week. If you're changing the lesson each week, that means your kids are missing half your lessons. This also means that half your curriculum budget is being wasted on kids who aren't there. By slowing down the rate of story change, Rotation makes SURE our irregular attenders are getting exposed to the MAJOR stories of the Bible, while deepening their knowledge in our regular attenders. Traditional curriculum's 52 new stories a year reflects a by-gone era. And quite frankly, it didn't produce Bible literacy or attendance anyway. Just ask the parents who used to sit in those classes, -if you can find them. Rotation is a Win-Win for regular and irregular attenders. Most Rotation fans can't imagine why anyone would want to go back to the way things were. Yet there are some churches that do just that. They "try Rotation" for a few years, and end up going back to graded curriculum. That's the "dirty little secret" about churches. 1. New leaders get hired who only see the workload, instead of the reasons behind the change. Or they have no investment in what the last person created and want to put their own stamp of the program. 2. Some teachers like control, and like being the professorial center of attention. Traditional curriculum is a feast of teacher-centered blah-blah-blah. 3. The traditional model is something people still remember, and so it's easy to adopt. 4. Churches with declining attendance or shifting demographics have high hopes that "the next new & improved curriculum" will solve their problems. 5. The curriculum publishing industry is always coming up with something shiny and new. See my full article about "How the Rotation Model Can Fail." I'm sure there are other good models. I'm also sure that the traditional one isn't one of them! Whatever model you choose, it must be able to overcome the realities of teaching with volunteers in today's Church, and the importance of repetition and creativity in learning. If it doesn't, if it doesn't confess and try to workaround our "dirty little secrets," then it too will fail. Neil MacQueen is a Presbyterian minister specializing in Christian education. He is co-author of the book, "Workshop Rotation: A New Model for Sunday School" (Geneva). Neil is one of the founders of Rotation.org. This article may be copied and used for teaching purposes provided its source is cited. Other photos from Rotation churches; used with permission. I think this article would be a great starting outline for some great teacher training! May have to think on this awhile. I'd be interested in seeing some information about the pitfalls of the Rotation Model. To my mind, one of the biggest things that curriculum writers (and yes, I know around here that's a dirt word, but hear me out) do is CONNECT concepts. What I mean is the curriculum writers usually have a set of core knowledge goals and concepts that they want kids to know by the end of the year. Then they use the different Bible stories to teach to those things (for instance: we'd like our kids to be equipped with these different prayer practices, have these basic core concepts about God, and be able to pray these verses/prayers). The problem with having only stories as an overarching scope and sequence without any core knowledge goals behind them is that each lesson can become "What would be a fun activity for the kids to do around the Moses story?" Yes, the kids will learn the Moses story (which is, in itself, valuable), but they may get to Middle School without any real concept of the core values/beliefs/tenets of their church's faith. They also don't get the chance to build on concepts (for instance, the idea of forgiveness may look different at 5, when their main relationships are with siblings, than at 10, when they've experienced the betrayal of a friend). In traditional curriculum writing, core concepts like that are visited repeatedly, delving more deeply into them in each succeeding year. I think the Rotation Model's weakness is that it either asks Christian Ed coordinators to become curriculum writers (for instance, I write all the lesson plans for my church so that they teach to the kid-language friendly core values I developed from our church's mission statement and vision--see core values I pasted at the end of this post) or it leaves the connections in the hands of volunteers (Okay, Susan. This week, we're making Moses baskets in Indian Paintbrush. Read the story, and here are your supplies. Now, go teach those kids!). The problem with the first is that not all Christian Ed coordinators are equipped to write curriculum (unless they've had some sort of background in education). The problem with the second is that the kids get a series of fun activities but are never really asked to think through the stories and how they inform or challenge our faith. I'm writing all of this because I love the workshop rotation model. It's been great for our church in many ways, but this is the major flaw I saw when I walked in. I think it's fair for every church considering the WoRM to know that this is the challenging part of the model. And it's something that needs to be addressed in the scope and sequence they set up, as well as in the way they execute each rotation's lesson plans. 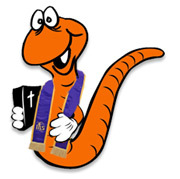 I would recommend the WoRM to any church...but not without a very careful setup team, a scope and sequence that extends beyond just the stories you want covered, and some really good lesson plan writers...or the budget to purchase some of the modules offered by different publishing companies. *God created everything and said that it was good. *God is with us in every moment, good and bad. *God loves and forgives us. *God is still speaking to us in many ways. *Jesus came to lead us into new life. *The Holy Spirit is in us and works through us. *We are God's hands, feet, and heart in the world. Thank you Sarah (PlymouthUCC) and LisaPA for responding. Sometimes it's like an echo chamber up here! Sarah, I certainly don't disagree with some of your criticisms. Even Jesus met with problems. Regarding "how the Rotation model can fail" ...I've had an "unpopular" article on this subject HERE for many years. Feel free to add to it. You wrote: "Curriculum writers usually have a set of core knowledge goals and concepts that they want kids to know by the end of the year." I wish this were true about all curriculum writers, but I've worked with and written for publishers, and their method of choosing "what to teach" isn't always as organized as you would think. I also know first-hand of at least one major denom publisher who picked its rotation stories based on what was NOT in their other curriculum, so as not to compete with their other products. (I'm talking about you Augsburg.) Years ago one of my own denom's publishers told me they assembled their stories by "meeting in small groups and coming together with stories on post-it notes, then negotiated with the other groups." Are we supposed to be teaching Bible stories? Are we supposed to be teaching a system of theological concepts through the careful selection of various Bible stories? Here's where I've been at for the last 20 years: "teach the major Bible stories in some semblance of order, repeating key stories, and knowing that each story has MANY theological facets." Joseph's story is a great example of a story that simply needs taught, not categorized. While a curriculum publisher might list it under "forgiveness", but it's also about honesty, perseverance, God's plan for your life, and more. Same with Exodus, same with Prodigal Son, same with Shepherds and Angels. Same with Last Supper. Many major stories DEFY categorization. Instead, they are rich in meaning and IF remembered, can unfold their meanings in the student's heart. That said, a Left/Analytical/Checklist approach to story selection CAN BE HELPFUL ...when you are trying to decide WHICH major stories to teach. YOUR suggested set of core beliefs or OUTCOMES are really great. I would add: "tell me the story that will drive those beliefs into their hearts and minds." And then tell me TWO STORIES for each! I agree with you completely that one weakness of SOME Rotation churches are those with volunteers and staff who don't have a grasp of the curriculum, ...and make it up as they go. Those folks will certainly have a hard time with any curriculum, published or free. One of the THINNEST Rotation curriculums I've ever seen is PowerXpress from Cokesbury. Go figure. "Dirty Secrets" is an admission that some teachers and leaders can turn ANY silk purse into a sow's ear. This is one of the reasons we SHOULD rotate our kids, ...to reduce the inevitable exposure to the mis-guided or ill-equipped. Rotation.org is certainly trying to address the need for DEPENDABLE, PEER-REVIEWED, PROFESSIONALLY EDITED Rotation curriculum. We call them the WRITING TEAM!! The writers on the Writing Team have theological and creative integrity. And Phyllis Wezeman our WT leader and editor has been one of the brightest names in CE curriculum publishing for many years. 30 different lesson sets and counting. The WT doesn't prescribe what stories WE think a church should teach. That's what your teachers/pastors are for. To the extent that they don't exercise such decision making in a local congregation, I can only say....God help them, because no amount of publisher's cellophane wrapping is going to save them from themselves. What's great is that YOU are on the job in your church paying attention to important decisions. You could easily pick stories from the WT list that fit your KEY QUESTIONS/BELIEF statements. I would encourage you to POST your list of stories that you use to answer those key belief statements, so that others churches who do NOT have YOU, can benefit from you! Neil, thanks for your thoughtful reply. I definitely agree with you about how we teach stories. It IS important that the stories have room to speak for themselves. I would never say that we're teaching to a checklist of beliefs. I more raise this question for interpretation--every church interprets stories. So are we honest about the bias from which we are interpret stories? Are we communicating with our kids about what our lens for interpretation is? And second, while I wouldn't want to teach to a checklist, I DO think we need some kind of "goalposts" (for lack of a better word). What if the kids get through six years of rotation and never learn about different prayer practices they can do? What if they get through six years and never have a session on generosity? I see what you mean about choosing scope and sequence carefully, but my experience is that one person chooses scope and sequence and then the coordinator leaves and another coordinator comes in and suddenly your institutional memory is lost. How do we make sure that we leave behind us some other, more definitive set of goals for learning than a six-year scope of stories? How do we make sure that new coordinators don't just teach the good idea of the month? I also acknowledge your greater experience in curriculum design/publishing. Certainly the publisher bias is to make money...hence the problems you expounded above. I'm coming at it more from an education background that looks at how a good lesson plan/year plan is constructed with goals, learning objectives, etc. (which your writing team writers certainly have...and I appreciate very much). I guess my rant here is more to encourage people to use WoRM thoughtfully, intentionally, to not jump into it thinking "this is the model that will save your Sunday School problem!" You're right...if churches aren't approaching their programs thoughtfully then no matter what curriculum they choose, they're in for a disappointment. Oh! One more thing. I went back to read your article on why the WoRM fails, and it's excellent. You're right on with all of those points. And I raise the question about what we leave the next CE director for the same reasons you said that the #2 reason for failure was the current CE director moving on. Yes. Yes. BUT...a new CE director is more likely to be bought into the model IF he or she weren't handed a nebulous program. The more we have in writing, the better, I think. The more strategic documents we create (things like student lists, volunteer lists, teaching team lists, clear lesson plans, charts of our tasks month-by-month), the more likely we are to leave the program in good hands when we step out. Part of implementing the program well is knowing that you're going to be replaced eventually...and caring enough about the kids to do more than leave a bunch of room decorations and good ideas. I find it interesting that there's currently YET ANOTHER national debate going on about "what the kids need to know and when." This time they are calling it "Common Core." From what I've read, a lot of it makes sense for things like Math and Science. But such a building block/standardized national approach is overkill when it comes to Gr 1-6 literature and history (which are more akin to Sunday School). I wish I could take credit for those insights, but alas, I merely reported on what others have suffered to learn. One of the truly GREAT things about this website is that good discussions, advice, and sheer screaming experience live on for others to contemplate --well past the person who posted them. And down the road the "best of" gets consolidated so it doesn't get lost (for those willing to seek and read!). Maybe that's the problem in local churches: no long term memories. We're like Israelites in the wilderness. I remember saying when we started Rotation that "I don't know where this is headed but I can tell you it won't be backwards." what criteria did you use in designing your Christmas program; etc. These are among the activities that need to be done over and over again, whether or not you have a new CE. They are never finished once and for all. We're eternally about doing a new thing. Involving volunteers in each of the processes is a fabulous way to educate your volunteer corps and parents, too. I remember very fondly one winter Saturday morning brunch and curriculum review workshop that involved 3 parents, only one of whom was a current teacher. It was a lot of work. But at the end of the morning, I had a great buy-in on the curriculum they selected (Rotation, of course, but it was a genuine choice on their part). I also had 3 great advocates for what we were going to do. They signed the newsletter article about our selection. Documenting the processes matters, too.